6-8pm: Cultural Showcase, Vendors & Silent Auction! Mi’kmaq Native Friendship Centre – 2158 Gottingen St.
Our Cultural Showcase features an internationally renowned group of Mi’kmaq singers, “Eastern Eagle”, as our host drum group, “Stoney Bear Singers” and “All Nations Drum”. We also have dancers from all powwow styles and a Hoop Dance Exhibition. The Silent Auction will include Fancy Shawl and Jingle dresses, artwork, hand drums, one night stay at Lord Nelson, and anything else people would like to donate. We are still looking for items/donations for the silent auction. All vendors are welcome and can contact us to reserve a table. To begin, we have one super funny Mi’kmaq, recently voted as Halifax’s BEST Comedian, nominated by the ECMA’s, and host of “The Candy Show”, Candy Palmater, as our nights event host!! 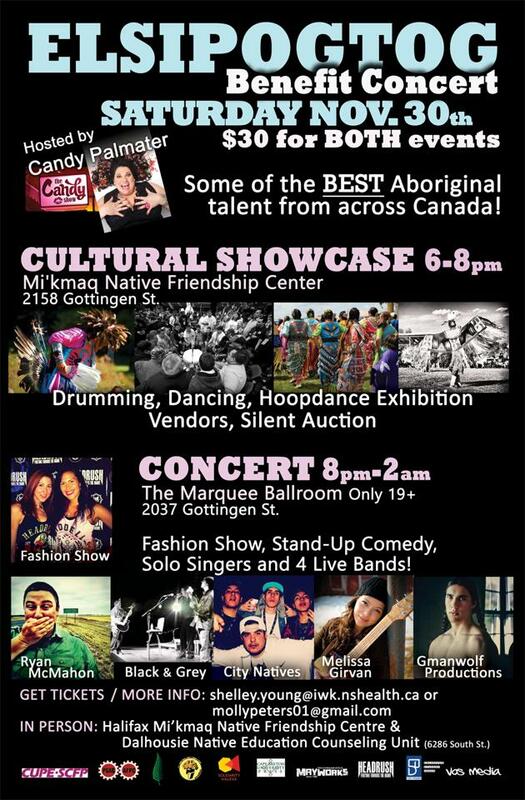 The Fashion Show will showcase HeadRush, The Vault and InkStarz Native designs by “Natasha Patles” and “Dwayne Everett Ward“- which will include both female and male Mi’kmaq models. We then have special guest, “Ryan McMahon“, a hilarious Ojibway Comedian, who’s flying in from Winnipeg to do Stand-Up Comedy for us! Our stacked music line-up includes Listiguj’s very own “Melissa Girvan” and “Gmanwolf Productions”, “Jocelyn Marshall”, “Kicking Krotch”, and two Aboriginal Hiphop Music groups who were recently nominated by the East Coast Music Awards for Aboriginal Recording Of The Year, “City Natives” and “Black & Grey” to perform for us LIVE!!! Background: Elsipogtog and allies are currently fighting to protect their water from fracking in Kent County. Since they began protesting in May, they’ve had over 50 people who were unlawfully arrested for peacefully protesting. Many women, elders and men have been hurt but they continue defending their territory for their children, grandchildren and for those to come. We now have four warriors, which includes three youth, who were incarcerated on Oct. 17th. I personally know these youth and know they’re good kids. All they wanted was to help Elsipogtog’s struggle, to protect our women and elders who were harmed by SWN’s security in June & July, and to protect our land & water. We want to support Elsipogtog/Rexton by raising funds to provide them with warm winter gear and shelter, and we’d like to raise legal funds for our young warriors who are still incarcerated. Please come out, help out or support in any way you can!! ♥ Visit Sacred Fire: The People United Against Fracking for additonal information. OR via EMT (Online Banking) in which ticket can be mailed or reserved at the door for you, by msg’n Shelley A. Young or Molly Jean Peters via FB or by emailing us at shelley.young@iwk.nshealth.ca, mollypeters01@gmail.com. “Lord Nelson Hotel & Suites” on Spring Garden Road for $109 per night. Quote “Elsipogtog” or “30070” when booking. “Delta Halifax” is also offering us $99 per night- but the price doesn’t include parking, which is roughly $20 per day. Also quote “Elsipogtog”.